You can install MySQL on Mac OS X 10.3.x ("Panther") or newer using a Mac OS X binary package in DMG format instead of the binary tarball distribution. Please note that older versions of Mac OS X (for example, 10.1.x or 10.2.x) are not supported by this package. Before proceeding with the installation, be sure to stop all running MySQL server instances by using either the MySQL Manager Application (on Mac OS X Server) or mysqladmin shutdown on the command line. When installing from the package version, you should also install the MySQL Preference Pane, which will enable you to control the startup and execution of your MySQL server from System Preferences. For more information, see Section 2.4.4, "Installing and Using the MySQL Preference Pane". When installing using the package installer, the files are installed into a directory within /usr/local matching the name of the installation version and platform. 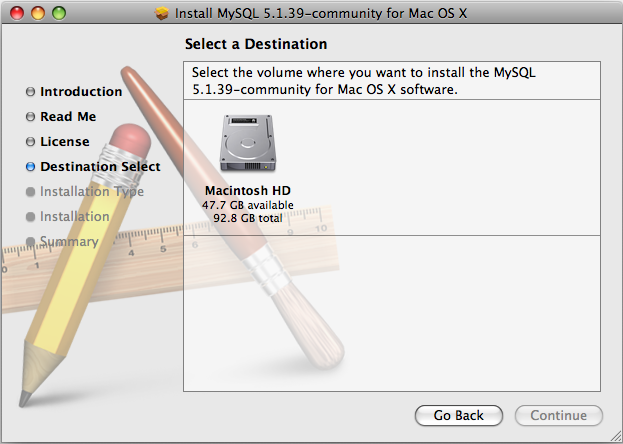 For example, the installer file mysql-5.1.39-osx10.5-x86_64.pkg installs MySQL into /usr/local/mysql-5.1.39-osx10.5-x86_64 . The following table shows the layout of the installation directory. Double-click the MySQL installer package. It will be named according to the version of MySQL you have downloaded. 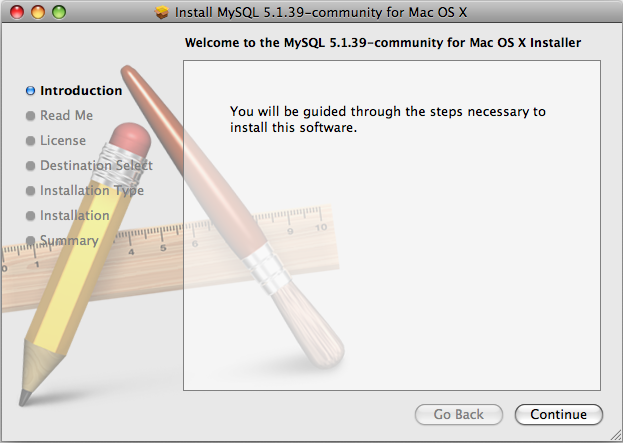 For example, if you have downloaded MySQL 5.1.39, double-click mysql-5.1.39-osx10.5-x86.pkg. You will be presented with the opening installer dialog. Click Continue to begin installation. If you have downloaded the community version of MySQL, you will be shown a copy of the relevant GNU General Public License. Click Continue . You will be asked to confirm the details of the installation, including the space required for the installation. To change the drive on which the startup item is installed, click either Go Back or Change Install Location.... To install the startup item, click Install. For convenience, you may also want to install the startup item and preference pane. See Section 2.4.3, "Installing the MySQL Startup Item", and Section 2.4.4, "Installing and Using the MySQL Preference Pane".